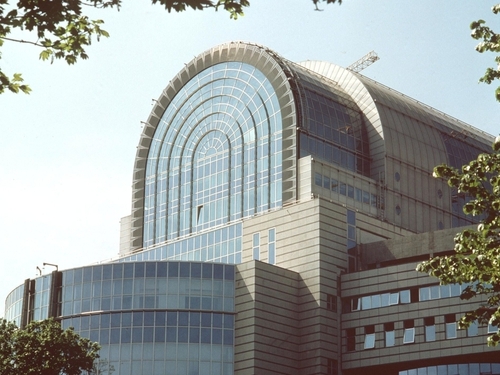 There has been an armed robbery at the European Parliament in Brussels. A lone man brandishing what he claimed was a hand gun entered a branch of the ING bank in the main building of the parliament and demanded the day’s takings which the staff handed over. The building was sealed off for a time as it was feared the man may have still been inside the building. The man appears to have gotten away with an undisclosed sum. Security officers are confident they can identify the unmasked gunman from security camera tapes. Security at the Eruoropean Parliament is high, with airport style screening of bags and people entering. Two floors below the robbery, a conference featuring the former Soviet leader Mikhail Gorbachev and Prince Albert of Monaco was taking place. The robbery inside the tight security perimeter of the building has raised question marks about a possible visit by President Obama in April.